A Stanley Cup Playoff berth does not appear likely for the Edmonton Oilers this season. Heading into play Thursday night, the Oilers are in 11th place in the Western Conference and would have to vault past both Nashville and Phoenix in order to challenge the Avalanche, Wild and Ducks for the bottom three seeds for the postseason. So in all probability, the Oilers will be scattering in a few weeks, some heading to the World Championships, others to an early summer. But the Oilers deserve a little attention before then, because to call this season a disappointment would be to ignore some of the positive things that have happened. We are going to ignore for a minute that the Oilers have recorded 13 of their victories – nearly 40 percent -- via the shootout. The fact is that in a transition year in which they have been hit hard by injuries, the Oilers have been competitive most nights, while a roster full of young players has gained valuable experience that will serve them well in future years. The story this week has been rookie Andrew Cogliano, who broke an NHL record with overtime winners in three consecutive games. Of longer-term importance is the lineup the Oilers have been winning with. In a 6-5 overtime victory in Chicago on Sunday, 15 of the Oilers' 18 skaters were 25 or younger, and five of those were 22 or younger. Edmonton's big additions last summer were defenseman Sheldon Souray and winger Dustin Penner. Souray appeared in only 26 games before being sidelined for the season with ongoing shoulder problems. Penner is close to a career high in points, which sounds impressive until you realize his previous high was only 45. Still, the Oilers have been respectable. They have a good chance of finishing above .500, and even at this late date they can at least fantasize about a hot streak that would lift them into the playoffs. More significantly, the Oilers can dream of next year. They can hope Souray will be healthy next season. They can also hope for good health for veterans Shawn Horcoff, Ethan Moreau and Raffi Torres, whose seasons were wrecked by injuries. Plus all those young guys will have an extra season of experience. Most notable has been the experience gained by youngsters Cogliano (20), Sam Gagner (18), Robert Nilsson (23), Kyle Brodziak (23) and Tom Gilbert (25). Gilbert had appeared in only 12 NHL games before this season, but has been a regular on the blue line this season, averaging more than 22 minutes a game and reaching double figures with 10 goals. Up front, Cogliano, Gagner, Nilsson and Brodziak all have been regulars, and together had combined for 41 goals and 128 points entering play Tuesday – not bad for four very young players whose last names are not Crosby, Malkin or Ovechkin. Cogliano scored the overtime winner against Chicago, repeating his overtime winner two nights earlier against Columbus, then turned the trick once again Tuesday against St. Louis. "Being here at a young age is pretty special," Gagner told the Canadian Press. "At the same time, you're not doing yourself any favors if you think that way. … It's time to prove we can play at this level and we can be successful." Coach Craig MacTavish said of all the kids; "To keep us winning and having some success, they've had to play well and they've done that." Who's hot -- Jose Theodore started the season as the backup to Peter Budaj with the Avalanche. But he's played increasingly well as the season has progressed. Theodore notched a 27-save, 1-0 victory over the Ducks on March 6. Wojtek Wolski scored the game's only goal. … For a change, the Oilers didn't wait for the shootout to get a win. Andrew Cogliano beat Columbus in overtime on March 7. Mathieu Garon made 30 saves in the 2-1 win. A loss would have been heartbreaking for the Oilers. They were 1.5 seconds from a 1-0 victory when they allowed the tying goal to Dan Fritsche of the Blue Jackets. … Peter Forsberg had two assists as the Avalanche notched a key 3-1 win against the Stars on March 8. Theodore made 25 saves. … Ten different Oilers had at least one point in a 6-5 overtime win over Chicago on March 9. Cogliano once again had the OT winner. He did it again on March 11 against the Blues, scoring with five seconds left in overtime. 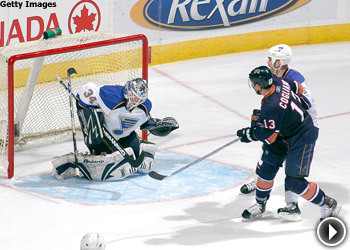 … Dion Phaneuf, Jarome Iginla and Alex Tanguay had three points each in a 7-3 rout of the Blues on March 10. … Ryan Kesler came up big for the Canucks on March 10. He scored with 2:41 left in regulation to erase a 1-0 deficit, then scored again 46 seconds into overtime for a 2-1 victory over the Kings. … Andrew Brunette scored twice as the Avalanche beat the Thrashers, 5-2, on March 11. Shootout summary -- The Wild blew two points by losing two shootouts. They fell 3-2 on March 7 in Atlanta and 3-2 at home to San Jose on March 9. In the Atlanta game, Niklas Backstrom only allowed one goal in three shots, but Mikko Koivu, Brent Burns and Brian Rolston were unable to beat Johan Hedberg. Against the Sharks, Koivu and Marian Gaborik were unsuccessful against Evgeni Nabokov. Pierre Marc-Bouchard did manage to beat the Sharks' goalie. But Backstrom allowed goals to Joe Pavelski and Patrick Marleau among the three shots he faced. 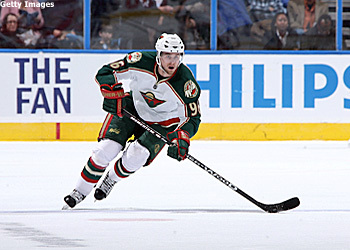 The Wild are hesitant to make Pierre-Marc Bouchard a full-time center. Rumor Mill -- The Denver Post suggested the Avalanche should consider re-signing goalie Jose Theodore, who recently has regained the form that marked the earlier part of his career with Montreal. … When veteran Wes Walz retired suddenly this season, it left the Wild with a void at center that they still haven't filled. The St. Paul Pioneer Press recently nominated winger Pierre-Marc Bouchard for the role. Bouchard is an outstanding playmaker, but the Wild's brain trust is hesitant to move him to center full time. "We know he can play the position," GM Doug Risebrough told the Pioneer Press, "but the problem is a lot of it is very physically demanding ... and very complex in terms of responsibility. I played both, and I can tell you, playing the wing is a lot easier than playing center." The newspaper suggested that Bouchard's status as an impending restricted free agent leaves the Wild reluctant to view him as a long-term solution at center. … The Vancouver Province reported that the Canucks have yet to speak to Markus Naslund about a new contract. The week ahead --The Flames will spend this week on the road, a place that often has been kinder than home ice to them this season. Thursday night's game at Atlanta follows a game 24 hours earlier at Washington. The trip continues in Chicago on Sunday and concludes in Columbus on Tuesday. The Avalanche have a busy week as they continue their playoff push. They're home against Edmonton and New Jersey on Thursday and Saturday, respectively. The Devils game is the Avalanche's last non-division game of the season. Monday, the Avalanche open a critical three-game trip at Minnesota. The Wild open the week with three home games – Thursday against the Devils, Saturday against L.A. and Monday against Colorado. Minnesota has a very tough road game Wednesday at San Jose. The Canucks continue their battle to squeeze into the playoffs with a very challenging week. They visit the upstart Coyotes on Thursday and the powerful Stars on Saturday. Then they host the Coyotes in a Monday rematch. The Oilers want to be spoilers. They visit Colorado on Thursday, Phoenix on Saturday and San Jose on Sunday. Then they open a four-game home stand against Phoenix on Tuesday.